Even though it may be a few months off, it is never too early to start planning your Christmas shopping strategy - especially if you're thinking of booking a trip to New York to stock up on this year's presents. If you are planning to look for all of your gifts in New York this year, you'll be heading into a city that takes the festive season to the next level. For the Big Apple newbies, use our guide below to make the most of your Christmas shopping trip to New York City. Christmas in the Big Apple. Image by Phil Whitehouse via CC BY 2.0 licence. For those that enjoy a bit of retail heaven every now and again, NYC will be your version of heaven. Whatever your tastes and whatever you're looking for, you'll be able to find it in this city. That's because there's a massive variety of shopping venues, which may be a little overwhelming if you've never been to New York before. To help you on your way, we've rounded up our go-tos so that you can find exactly what you're looking for this year. If you're looking to snag a deal, there are two dates you'll need to keep in mind. November 27th is Black Friday, where most stores will be having massive discounts on all of their stock. The second date - and the one that gives you even bigger savings - will be 26 December, where shops will be selling all of the wares they didn't manage to get rid of before Christmas Day - but at a fraction of the original price! Fifth Avenue at Christmas time. Image by Ralph Daily via CC BY 2.0 licence. In the months leading up to Christmas Day, stores and shopping malls will be staying open late to accommodate your every shopping whim. Easily the most famous shopping location in New York, Fifth Avenue is guaranteed to be crowded, but for good reason. This where you'll find the city's biggest stores and biggest names. You'll find the flagship stores of Alexander McQueen, Yves Saint Laurent and more, as well as department stores that often take up an entire city block. The big names to look out for here include Saks, Lord & Taylor, Bergdorf Goodman and Henri Bendel; these are all multi-level shopping havens but best get there as early as possible! If you're looking to splash the cash, the renowned Tiffany and Co. can also be found on Fifth Avenue. It's the perfect spot to spoil that special someone with a piece (or three) from their iconic jewellery line. Looking for something more quirky and unique? You'll need to head into the neighbourhoods of SoHo and Nolita. It's here that you'll be able to find a number of boutique stores selling all manner of vintage and retro clothing and jewellery. Look out for popular outlets like What Goes Around Comes Around, Quality Mending Company and Amarcord. If your loved ones are aspiring chefs, there are plenty of gifts from New York that would keep them occupied. For the latest and best new kitchen equipment, pop into Broadway Panhandler or the Brooklyn Kitchen. If you're looking to source authentic or rare ingredients, the city has a number of highly praised food shops; there's Buon Italia for Mediterranean staples, Eleni's New York for customisable sweet treats, Kalustyan's for spices and dried ingredients or Hong Kong Supermarket for all your Asian cookery needs. Or is your foodie friend looking for inspiration? There's only one place to go to: Kitchen Arts and Letters. This store is stocked with a wide range of cookbooks, coffee table tomes and other food-related literature - be warned, you might spend hours in here! 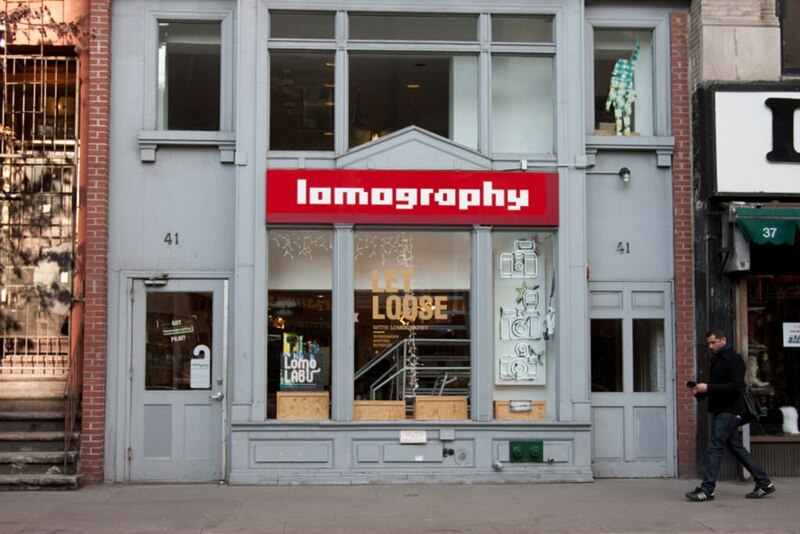 NYC's Lomography store. Image by Roberto Ventre via CC BY-SA 2.0 licence. We've covered the clothing and the food but now it's time to focus on the arty folk in our lives. For those looking to pick up fashionable art pieces and decor, head straight to the Museum of Modern Art (MoMA) gift shop, where you'll find gifts inspired by the modern art greats like Picasso, Pollock and more. For the photographers, you'll be able to pick up the latest gear at the Lomography Gallery Store. The music fans are covered too, as you can find a huge range of CDs, DVDs and vinyls at Academy Records. There are unique gift opportunities at Printed Matter, Inc too, where coffee table books and over 15,000 other publications - all designed by artists - draw in the crowds every festive season. Union Square Holiday Market in the snow. Image by Mack Male via CC BY-SA 2.0 licence. When you tire of the shiny shopping malls and department stores, have a change of scenery at one of New York's Christmas markets. There'll be a number of these markets happening across the city and these are perfect for picking up unique festive gifts. 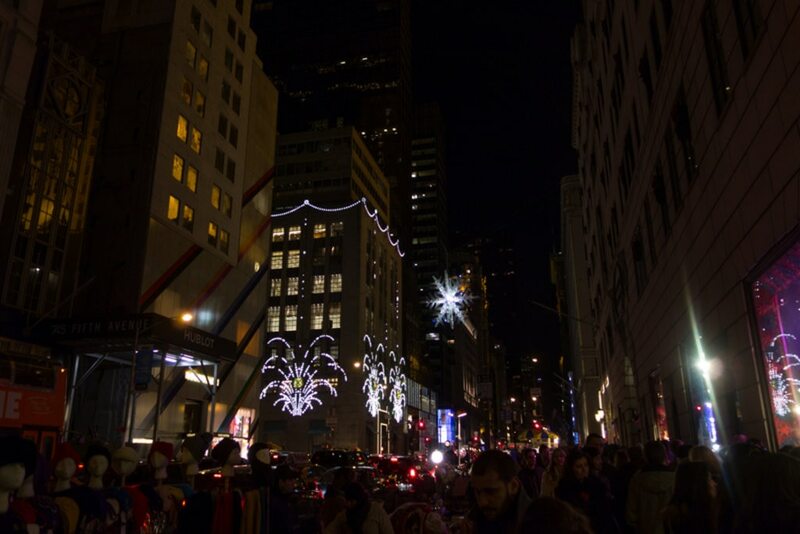 In addition to these annual markets, keep your eye out for the plethora of holiday pop-ups that will be happening all over the city. Here's a round up of our favourite markets in the Big Apple. Winter Village at Bryant Park - Over 100 boutique shops from around the world, offering decorations, jewellery and unique foodie gifts. 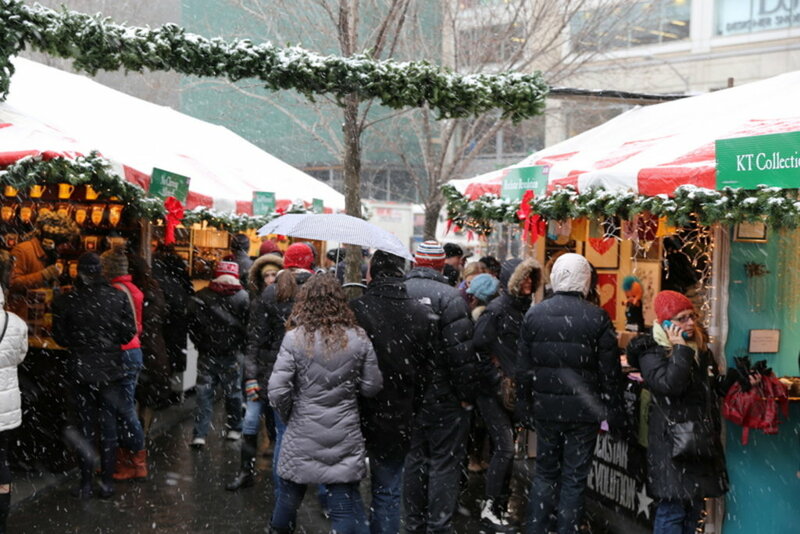 Union Square Holiday Market - One of New York's most popular festive markets. People wander down aisles lined with holly, while perusing wares of fine art, jewellery and toys. Dates: 19 November - 24 December. Grand Central Holiday Fair - Unlike many of the other markets, this is an indoor version featuring over 70 booths. Vendors specialise in handmade crafts and unique gifts. Dates: 16 November - 24 December. Holiday Market at Columbus Circle - No trip to New York would be complete without a visit to Central Park. Go to the park's southwest corner to find this holiday market, where you'll not only find hot food but also gifts from the 120 artisan stalls setting up shop here. Dates: 1-24 December. While we've been talking about proper shopping up until now, a retail-focused trip wouldn't be complete without some window shopping, right? And there's no better time to do this - you'll find some of the world's most elaborate Christmas-themed window displays while strolling around New York's main shopping district. 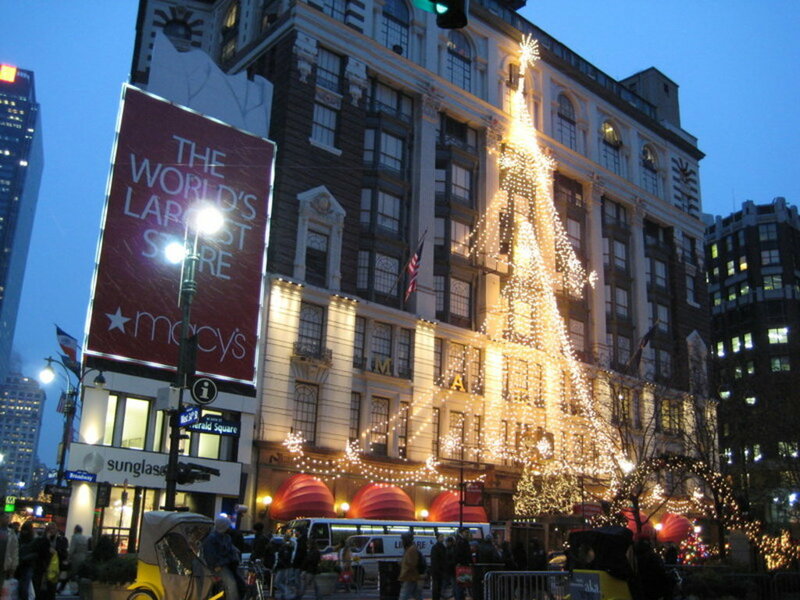 The department stores all compete for the best display so make sure to stop outside the big names like Bergdorf Goodman, Macy's, Bloomingdales, Saks Fifth Avenue, Barneys and Lord & Taylor. Past displays have featured everything from the biggest names in high fashion and celebrities to impressive mechanical tricks. Who knows what Christmas 2015's windows will involve? 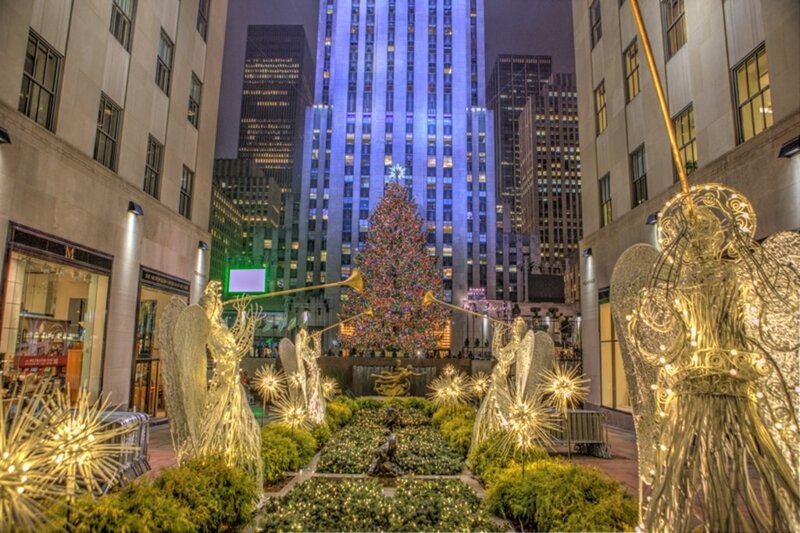 Christmas time at the Rockefeller Center. Image by Anthony Quintano via CC BY-SA 2.0 licence. Dare I say it, but there's more to Christmas in New York than just the shopping. When you need to take a break from the checkout points and shopping-mad crowds, we're happy to report that there's plenty of things to do during the festive months. If you have some kids in tow, head over to one of the city's ice rinks. Go to the most popular rink outside the Rockefeller Center, where you'll be skating near New York's most iconic Christmas tree decorated with over 30,000 lights! Other rinks can be found at Bryant Park's Winter Village, Central Park and Riverside State Park. Another children-focused activity can be found at FAO Schwarz, New York's top toy store, which is home to giant piano keyboard. Perfect for kids or for the kids-pretending-to-be-adults out there. If you'd like to go all out, New York's stages and theatres will be filled with Christmas-appropriate shows. Try to get a ticket to the Radio City Christmas Spectacular, which runs 15 shows a day in the lead up to Christmas Day, or catch The Nutcracker, which is performed annually by the New York City Ballet. Now that you know where to shop (and where to take a break from said shopping), why not take the next step and check out our deals for New York?